This pattern is part of the "Purposeful Patterns" initiative - a series of designs benefiting a variety of causes. $1 from the sale of each Taos Lap Blanket pattern will be donated to Partnership With Native Americans, a nonprofit organization committed to championing hope for a brighter future for Native Americans living on remote, isolated and impoverished reservations. PWNA is the only Native-serving charity to work on 60 reservations year-round. Donate directly to PWNA here. The Taos Lap Blanket was inspired by the beautiful shapes and woven fabrics in the southwest, particularly in the city of Taos, an artist’s haven in New Mexico’s high desert. 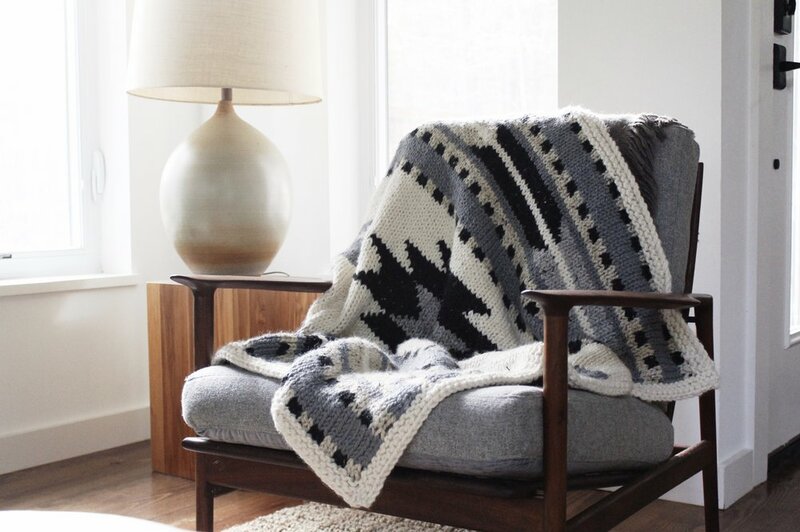 This throw is the perfect size for the lap both on the couch and in the car, and makes an excellent gift for a winter baby. This is an intermediate level knitting pattern and the techniques involved are the knit stitch, purl stitch, changing colors, stranded and intarsia colorwork, color chart reading, and picking up and knitting stitches.